We had so many creative comments!!! Thank you everyone for making this so fun. The BRONZE goes to KELLY! The SILVER goes to BEE! 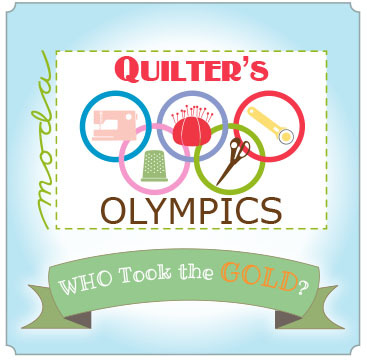 “ i’d be a Gold medalist for the doubles sewing event with my mom! The GOLD goes to KAREN in BREEZY POINT !!! “I would win the gold in “square footage take over”. I’m not sure how I got him to agree, but my husband helped me move my sewing stuff into our huge master bedroom. We then squeezed our king-size bed, dresser, armoire, and 2 bed side tables into what had been my sewing room with about half the square footage. Our guest bath is my “quilt locker” with quilts draped over the shower rod, plastic bins of fabric and UFO’s in the bath tub, and boxes of batting on the toilet. I can’t receive sleep-over company, but I have plenty of room to work on my quilts! Email me with your physical address & I will get your goodies to you in a jiffy! Congratulations to all the deserving medal winners. I’m standing here with my hand over my heart waiting for the anthem to begin. How about the “Scrap Bag Polka” or “100 Ways To Hide Your Stash”? 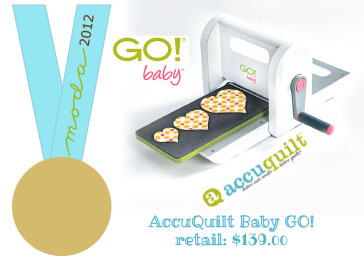 I’m loving, “Why Don’t You Have Plain White?”, “No Such Thing as an Ugly Quilt”, and “Quilter’s Husband’s Lament”. 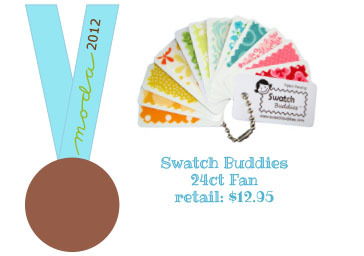 Thank you Moda judges for awarding me the Gold Medal in the Square Footage Take Over event. I want to thank my family and especially my husband–I wouldn’t have made it to this point without his help and support (and enabling). Seriously, thanks so much!! I’m thrilled–and now I have lots of room for a Go Baby!! 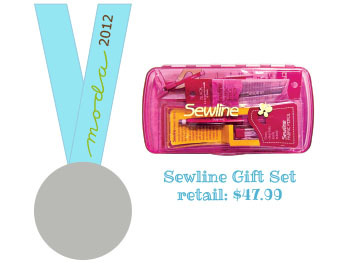 Look forward to trying out the Sewline products and of course sharing them with my mom/team mate! Congrats to all, especially my doubles partner and daughter. What fun!